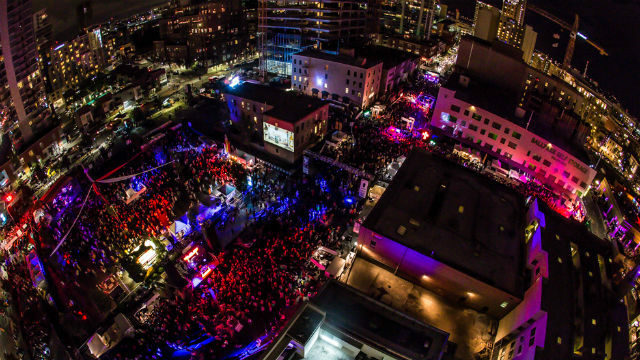 San Diego’s biggest and scariest Halloween party conquers eight blocks in the Gaslamp Quarter on Saturday night. Thousands of San Diegans in over-the-top costumes will roam the streets, competing for a $5,000 prize. The main entrance is at 8th Avenue and Market Street. Tickets are $55 on Friday, and $60 on Saturday. You can enjoy the night of revelry and stay safe by taking the trolley. The Metropolitan Transit System is running late-night trains and offering mobile ticketing. The last trains out will be 12:28 a.m. on the Blue line, 12:31 a.m. on the Orange line and 12:38 a.m. on the Green line. The Little Italy neighborhood opens up to little trick-or-treaters on Friday, with businesses along historic India Street handing out goodies from 5:30 p.m. to 7:30 p.m. Families are encouraged to bring children in costumes. Maps showing the participating businesses are available from the Little Italy Association at the Piazza Basilone. The coastal town of Encinitas celebrates the Dia de los Muertos on Saturdary from noon to 4 p.m. at the Encinitas Community Center, 1140 Oakcrest Park Drive. Enjoy performances, art-making workshops, a student art exhibit, artist demos and food trucks. Halloween comes to San Diego’s most famous ship with lantern-led tours of the Star of India on Saturday night. Ghosts, goblins, pirates and princesses will hear eerie legends from the tall ship’s storied past, including young John Campbell’s fatal plunge from the rigging and other creepy tales. The tours are from 6 p.m. to 10 p.m. Tickets are $8 to $16 and include admission to the Maritime Museum, which will be open until 8 p.m. The La Jolla Music Society’s Discovery Series opens with French clarinetist Raphael Severe at the auditorium at Scripps Research Institute on Sunday at 3 p.m. Severe began learning music at an early age and won five international competitions at the age of 12. He will play works by Poulenc, Devienne, Berg and Weber. Tickets are $30. The Scripps Institution of Oceanography‘s newest research vessel, the R/V Sally Ride, will be open to the public from noon to 4 p.m. on Sunday at Broadway Pier downtown. Tours are free and self-guided. Identification is required, and you must wear closed-toe, closed-heel shoes and be able to climb stairs.